Flying Flowers voucher codes and discounts - save up to 50% with april bargains! Everyone loves to receive flowers, whether it's a special bouquet to the one you love or a way to make a friend smile when they're having a tough day. And with a Flying Flowers promo code, you can give the gift of beautiful blooms without breaking the bank. From romantic roses to summery sunflowers and everything in between, a Flying Flowers discount code will save you money while you shop. Flying Flowers started life in Jersey way back in 1981, when the innovative business began offering an alternative to postcards for visiting tourists. Instead, they were given the opportunity to send bunches of beautiful local carnations home to their loved ones. The idea was a resounding success, and Flying Flowers was born. Over three decades later, Flying Flowers is still committed to the same ethos it prescribed to when it was founded – offering high quality flowers at excellent value prices, delivered to doorsteps around the country. The classic carnations which were initially stocked are still available to this day, and remain among the companies best-sellers. 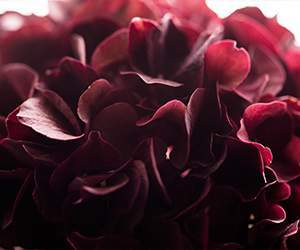 Now, they have been joined by a fantastic range of flowers and blooms from around the world, all freshly picked and carefully packaged to ensure they are in perfect condition when they arrive. At Flying Flowers' comprehensive online store customers can browse over 140 hand-made bouquets featuring both classic and exotic blooms in every colour imaginable. Bouquets are available to browse by occasion, or by your favourite flowers – so it's really easy to find the products that you're looking for. Want to surprise your mum with a gorgeous bunch of lilies or chrysanthemums? At Flying Flowers you'll find plenty to choose from, whether you're shopping on a budget or going all-out. Or perhaps you're searching for the perfect flowers for a wedding, birthday or new baby? Let Flying Flowers' expert staff help you find exactly the right bouquet to raise a smile on your loved one's face. At Flying Flowers, they've thought of everything – you even get a free pop-up vase with every order so whoever you're treating won't have to rush around finding something to put the flowers in when they arrive. And with their fast, efficient delivery service – free on all orders – you can relax knowing that your bouquet will arrive at its destination exactly when you intended. Want to get shopping with Flying Flowers? With a Flying Flowers promo code you can enjoy great savings on their wide range of quality fresh flowers. So whether you're spoiling a friend or just treating yourself, a Flying Flowers voucher code will help you save the pennies. Free delivery and free po-up vase with every order. Browse our website until you find a Flying Flowers promo code that suits you, then navigate to their website to begin shopping. Enter your Flying Flowers code in the box provided and click 'Redeem'. If you've enjoyed shopping with Flying Flowers, you might also like to shop more great deals on bouquets and more at stores like Bunches.co.uk and Flowers Direct. Or, if those aren't right for you, you'll find plenty more deals to browse in our Flowers and Gifts section. Enter your Flying Flowers promo code in the box provided and click 'Redeem'. Choose a delivery date and click 'Continue'. Enter your message and click 'Continue securely'. Need to speak to the team at Flying Flowers? Whether you have a question about your order, need some help picking the right flowers or simply want to find out how you could make fantastic savings with a Flying Flowers discount code, you can contact the Customer Services department by telephoning 0333 033 0844. Want to discover more about fresh flowers by post with Flying Flowers? The company maintains a profile across all your favourite social media networks. Follow them for access to lots of exclusive content including special offers, competitions and more. You can also use these pages to find out more about saving money with a Flying Flowers voucher code. Don’t forget to check them regularly, as you can never be sure when a free Flying Flowers discount code might be waiting for you! 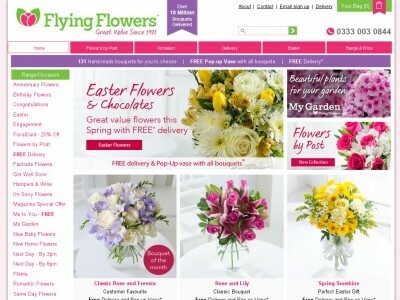 Buy now online at www.flyingflowers.co.uk. I wanted to send my mum flowers for her birthday, but everything I found online was so expensive. Then I discovered a Flying Flowers promo code. 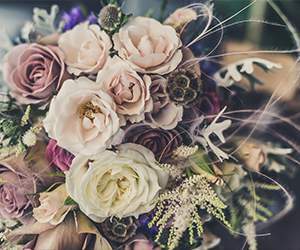 At flyingflowers.co.uk they stock a fantastic selection of beautiful flowers in all colours to suit any budget – all available at a great rate with a Flying Flowers discount code. I used my Flying Flowers voucher code to get an amazing deal on a lovely bouquet of summer lilies, delivered direct to mum's door. 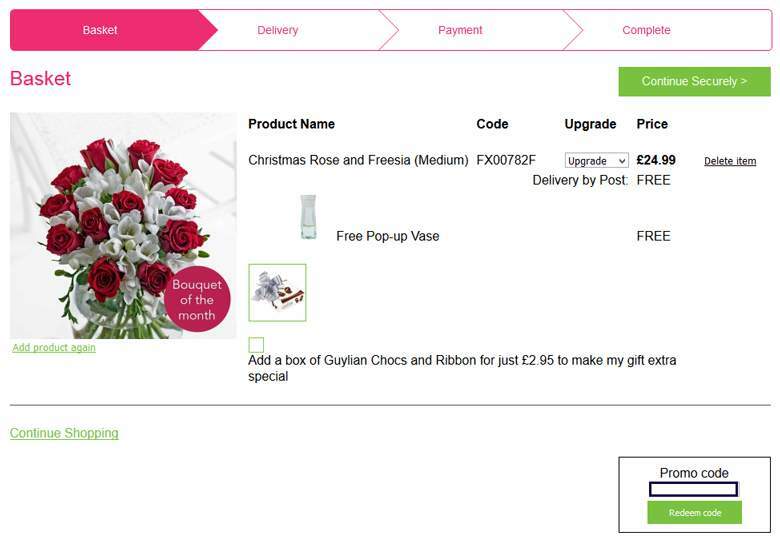 So why not treat someone special with a Flying Flowers code?